I thank you all for turning out en-masse for the March 28 General Elections. I promised the country free and fair elections. I have kept my word. I have also expanded the space for Nigerians to participate in the democratic process. That is one legacy I will like to see endure. Although some people have expressed mixed feelings about the results announced by the Independent National Electoral Commission (INEC), I urge those who may feel aggrieved to follow due process based on our constitution and our electoral laws, in seeking redress. As I have always affirmed, nobody’s ambition is worth the blood of any Nigerian. The unity, stability and progress of our dear country is more important than anything else. I congratulate all Nigerians for successfully going through the process of the March 28th General Elections with the commendable enthusiasm and commitment that was demonstrated nationwide. I also commend the Security Services for their role in ensuring that the elections were mostly peaceful and violence-free. To my colleagues in the PDP, I thank you for your support. Today, the PDP should be celebrating rather than mourning. We have established a legacy of democratic freedom, transparency, economic growth and free and fair elections. For the past 16 years, we have steered the country away from ethnic and regional politics. We created a Pan-Nigerian political party and brought home to our people the realities of economic development and social transformation. Through patriotism and diligence, we have built the biggest and most patriotic party in Nigerian history. We must stand together as a party and look to the future with renewed optimism. I thank all Nigerians once again for the great opportunity I was given to lead this country and assure you that I will continue to do my best at the helm of national affairs until the end of my tenure. I have conveyed my personal best wishes to General Muhammadu Buhari. May God Almighty continue to bless the Federal Republic of Nigeria. 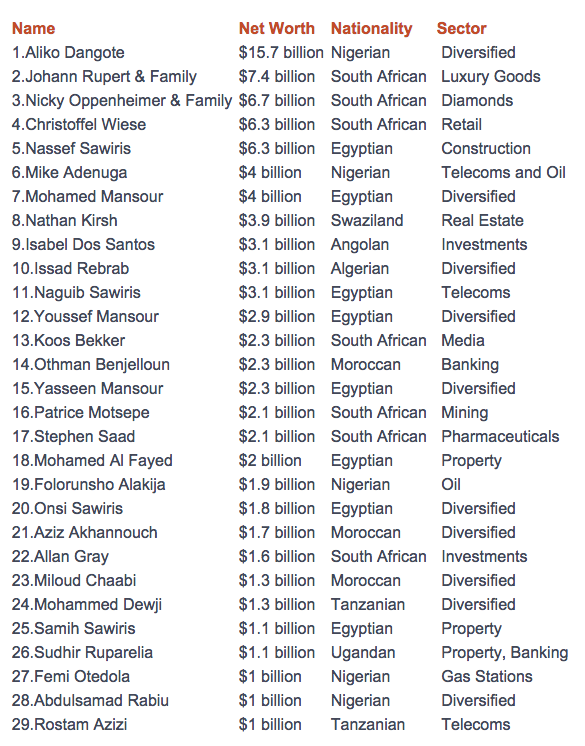 Only 9 out of 54 African countries are represented on the 2014 Forbes billionaires list. There are certainly more than 29 dollar billionaires on the Continent (most of the rest being in politics). Let’s consider this list as representative of countries in which (for whatever reason) it is politically safe to be publicly super wealthy – which in and of itself says a lot about how far Nigeria has come. Some will look at the list and scream inequality. I look at the list and see the proliferation of centres of economic and political power. And a potential source of much-needed intra-elite accountability in African politics. For more on this read Leonardo Arriola’s excellent book on the role of private capital in African politics. See also this FT story on the impact of currency movements on the wealth of Nigeria’s super rich. Forbes also has a great profile of Aliko Dangote, Africa’s richest man. Africa Confidential has a great piece analyzing leaked documents from PwC, the professional services firm, showing the various arrangements that enable multinational companies to evade taxes in Africa. You can read the whole piece here (gated). A second tax avoidance mechanism simply involved the companies becoming incorporated in Luxembourg. In 2010, Luxembourg concluded an agreement with several companies of the Socfin (Société financière) agribusiness group, which was founded during the reign of Belgian King Leopold II by the late Belgian businessman Adrien Hallet. 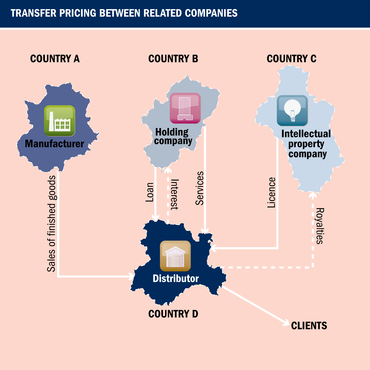 The companies chose Luxembourg as their base and made an agreement under which their dividends were subject to a modest 15% withholding tax, a lower figure than those in force where their farms are located (20% in Congo-K and Indonesia, 18% in Côte d’Ivoire). Altogether, Socfin subsidiaries in Africa [in Sierra Leone, Nigeria, Liberia, Cote d’Ivoire, and Cameroon] and Indonesia produced 123,660t. of rubber and 380,770t. of palm oil in 2012. The combined turnover of its main African subsidiaries reached €271 mn. in 2013. The list also includes the 100%-owned Plantations Socfinaf Ghana Ltd. (PSG) and Socfin-Brabanta (Congo-Kinshasa). Socfin also holds 88% of Agripalma in São Tomé e Príncipe and 5% of Red Lands Roses (Kenya). A third mechanism involves cross-border lending within a group of companies. Companies registered in Luxembourg are exempt from tax on income from interest. According to the Thabo Mbeki High Level Panel report between 1980 and 2009 between 1.2tr and 1.4tr left Africa in illicit flows. These figures are most likely an understatement. Multinationals, like the ones highlighted by Africa Confidential, accounted for 60% of these flows. Alex Cobhan, of the Tax Justice Network, has a neat summary of the various components of illicit financial flows (IFFs) and how to measure them. He also proposes measures that could help limit IFFs, including: (i) eliminating anonymous ownership of companies, trusts, and foundations; (ii) ensuring that all bilateral trade and investment flows occur between jurisdictions which exchange tax information on an automatic basis; and (iii) making all multinational corporations publish data about their economic activity and taxation on a country-by-country basis. In much international coverage of the race, whether by non-Nigerian journalistsor Nigerians speaking to international audiences, the two candidates have been presented in crude and one-dimensional ways. The narrative at work in such commentaries says that Jonathan is a bumbler – a nice guy perhaps, but ultimately an “accidental president” who is in over his head, too incompetent to deal with problems like corruption or the violence caused by Boko Haram in the northeastern part of the country. Meanwhile, the same narrative tells us that Buhari is a thug – an essentially military man whose record is fatally tarnished by his regime’s actions in the 1980s, and whose prospects for winning the presidency have grown only because of Nigerians’ anxieties about Boko Haram. The narrative goes on to say that Nigerians face two very bad choices for president – perhaps implying that “the devil they know” is the better choice. The rest of the blog post is here (highly recommended). In related news Nigeria’s INEC on Tuesday announced that it had hit a 75% PVC issuance rate (or around 52 million people) to the almost 67 million registered voters. This included an average issuance rate of 76% in the three states worst hit by the Boko Haram insurgency (Yobe, Adamawa, and Borno). On June 17th Nigeria experienced its first ever suicide bomb attack. Boko Haram, a militant Islamic group that seeks the imposition of Sharia Law in all of northern Nigeria, claimed responsibility for the attack. The “nationalization” of the Boko Haram problem will intensify pressure on elected leaders and security forces to deal decisively with the group and prevent further attacks. Nigerian officials have proposed solutions ranging from crackdowns to outreach programs to amnesty offers. The government has to some extent pursued all of these options. Yesterday former Kano State GovernorIbrahim Shekarauproposed a hybrid approach of sorts, which would rely on intelligence gathering to defeat the group while advancing employment programs to deal with social and political grievances in Northern society. Whatever course the government pursues, the Boko Haram problem has already led several Northern leaders, including the newly elected Governor Kashim Shettima of Borno State, to speak quite bluntly about the North’s serious problems of economic stagnation and political isolation. Northerners have been voicing such concerns for some time, but perhaps now these concerns will reach a broader audience and stimulate a debate that goes beyond just the issue of Boko Haram. Since the unification of Nigeria in 1914, the north has continued to lag the south in a number of socio-economic indicators. Years of military rule by northern generals did not make things any better. Most of the country’s oil revenue wound up in Swiss bank accounts and as investments in properties in European cities – even as regular folk in Kano, Katsina and Maiduguri, and in the wider northern region, continued to wallow in poverty. In a sense Boko Haram and its ghastly attacks on civilians and government installations is as much a rejection of Western/Christian education (its name loosely translates to non-Islamic education is a sin) as it is an indictment of northern Nigeria’s leadership. Even by Nigerian standards, the north is doing very badly. It is hard to ignore the fact that regular southerners are inching ahead of their northern counterparts despite the generous revenue sharing arrangements among Nigeria’s 36 states. What does this mean for national politics and governance in Nigeria? Well, for one we know that the apparent north-south political divide in the last election was merely an artifact of presidential politics. Gubernatorial elections revealed that northern elites are also aboard Goodluck Jonathan’s gravy train. Northern Nigerian elites are as much a problem in the north’s underdevelopment as the historical north-south divide. In light of this, groups like Boko Haram show that the northern elite in Nigeria can no longer play the north-south card while keeping all the money from the national treasury to themselves. The men and women on the streets and in northern rural areas also want their cut. I hope Abuja will not bury its head in the sand and pretend that Boko Haram is purely a security problem. Kenya tried doing the same with the Mungiki group (with extra-judicial executions and all) without much success. To Abuja I say: you must try to solve the problem you have, not the one you wish you had. Nigerian President Goodluck Jonathan has taken a wide lead in elections in Africa’s most populous nation, results showed today, putting him on a possible course for a first-round victory. Millions of voters turned out for Saturday’s election as Africa’s most populous country bid to put years of rigging and badly flawed ballots behind it and hold the cleanest polls for head of state in nearly two decades. Observers gave the polls an initial thumbs up, but concerns were raised over regional divisions, a scenario many analysts had hoped to avoid in a country as fractious as Nigeria, roughly split between Christians and Muslims. Results from 30 states showed Jonathan had won 20, while ex-military ruler Muhammadu Buhari had nine and the former head of the anti-graft agency, Nuhu Ribadu, had one state. Mr. Jonathan’s cross-national victories are a good omen for Nigerian unity moving forward. Now the big question is how Mr. Jonathan and the PDP will govern. Top on the agenda will be Nigeria’s energy problems. Sub Saharan Africa’s largest oil producer also happens to be one of its biggest importers of refined oil products. No new refineries have been built in the country in ages. The country also suffers frequent power outages despite the fact that millions of cubic metres of gas get flared in its oil fields daily. About 23 billion cubic metres get flared annually in Nigeria (second only to Russia). That is 23 billion cubic metres of gas that can be harnessed for power production or LPG. The last time Nigeria had a transparent election was in 1993. Then, opposition leader Moshood Abiola won the election only to be denied the chance to lead Nigeria by strongman Ibrahim Babangida. Mr. Abiola died in jail in 1998. Nigerians had to wait until May of 1999 to see the end of kleptocratic military rule. Mr. Olesegun Obasanjo, a former military ruler, was Nigeria’s first elected president since the early 1980s. His party (Mr. Obasanjo’s) the People’s Democratic Party (PDP) has since then won two elections under questionable circumstances, to put it mildly. The latest election appears to be different. Initial results show that PDP is set for a thumping in the legislative and governorship races, although its presidential candidate (Goodluck Jonathan) is still the front-runner with 62% approval rating. Credit goes to Attahiru Jega, a professor of Political Science and head of the Independent National Electoral Commission (INEC), for ensuring that the Nigerian elections have credibility both at home and abroad. Watch this space for the results of the gubernatorial and presidential elections in the coming weeks. The Nigerian government has failed its people in so many respects that we have come to not expect the men and women in Abuja to deliver much. That said, this is too much. At the risk of sounding religiously intolerant, I am gonna go out on a limb and say that this should be considered cruel and unusual punishment.